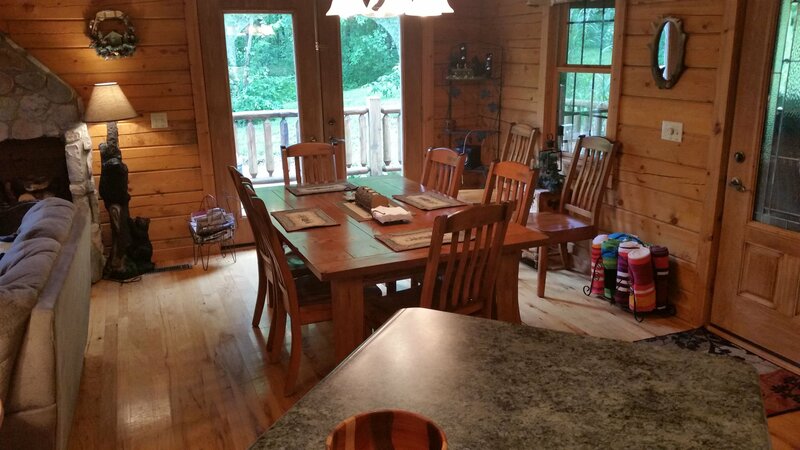 Adventurewood Log Cabin is a lovely cedar toned log home on 7 private acres in beautiful Brown County, Indiana. Located 1/2 way between Nashville and Bloomington, it is just minutes from everything, including shopping, dining, hiking, biking, and much more. Brown County State Park is 3 miles away and Lake Monroe is 15 minutes away. 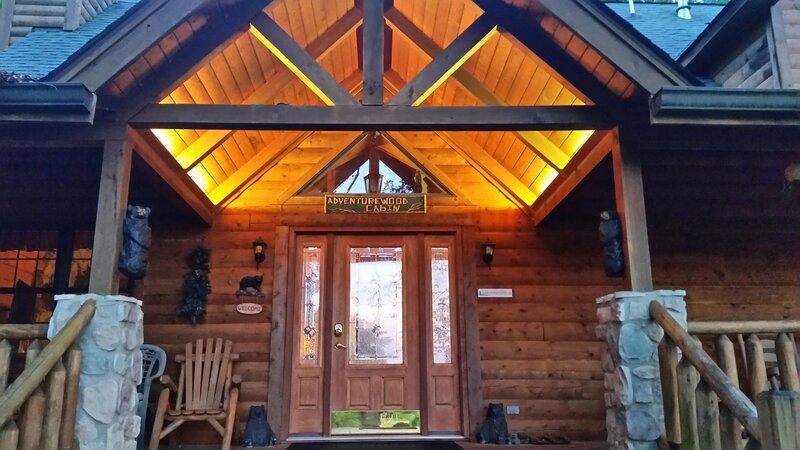 Set on a private wooded knoll, the view from the beautiful front entrance overlooks one of the prettiest valleys in Brown County. Your closest neighbors are the deer that you will see from the front porch at dusk. 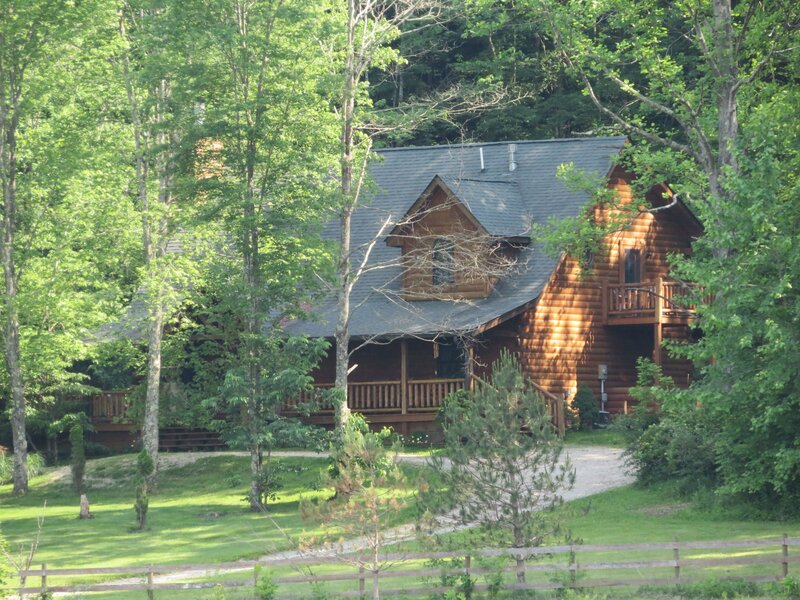 Adventurewood is a beautiful retreat for all seasons. You've arrived! Welcome to Adventurewood Log Cabin! Just inside the front door, the great room features cathedral ceilings, hickory floors, and a two-storey wood burning stone fireplace. 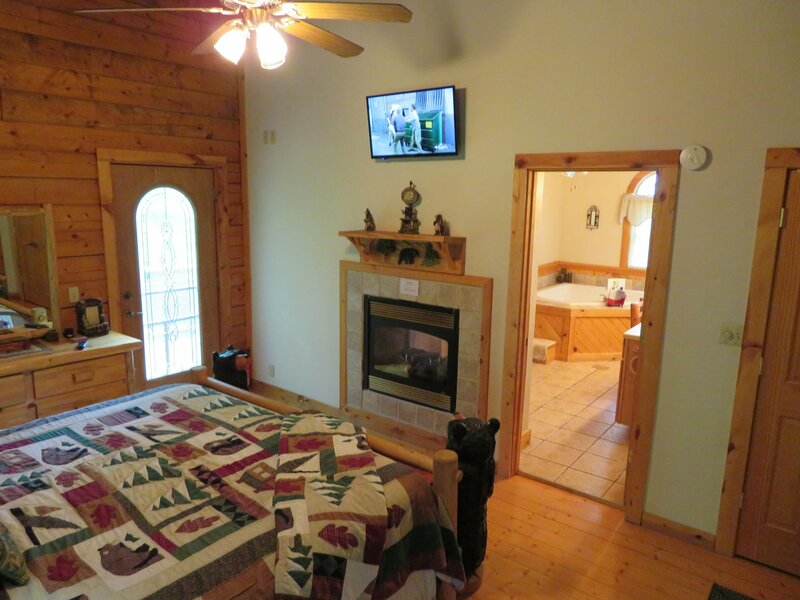 The many windows provide a beautiful view of the surrounding woods and valley. 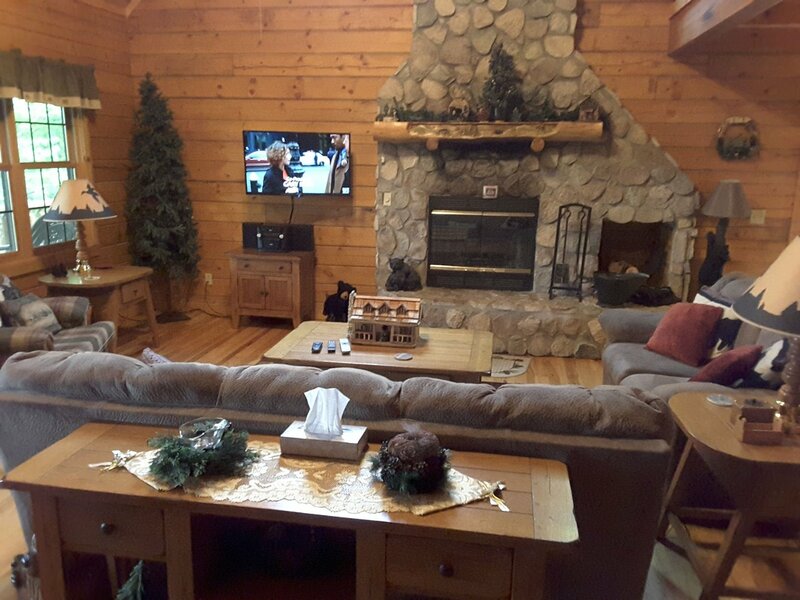 Relax in comfort by a crackling wood fire and enjoy TV with VCR, DVD, or one of many Dish network channels, or music on the CD player. Just off the loft area upstairs is the beautiful master bedroom suite; perfect for that romantic Brown County getaway. 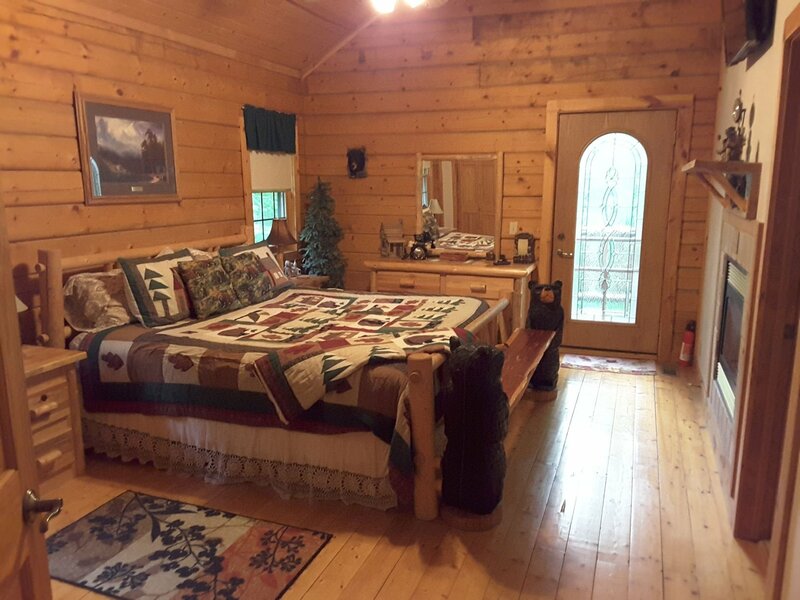 Decorated with log furniture, it features a king-size bed, cathedral ceilings, ceiling fan larger dresser, and closet. A door opens to your private balcony overlooking the woods and valley. The master suite also features a romantic two-sided (see-through) gas fireplace that separates the bedroom from the large, elegant master bath. The gas fireplace in the master suite is on a timer so you can just crawl in bed and enjoy. The TV is connected to the main DVR and satellite dish. 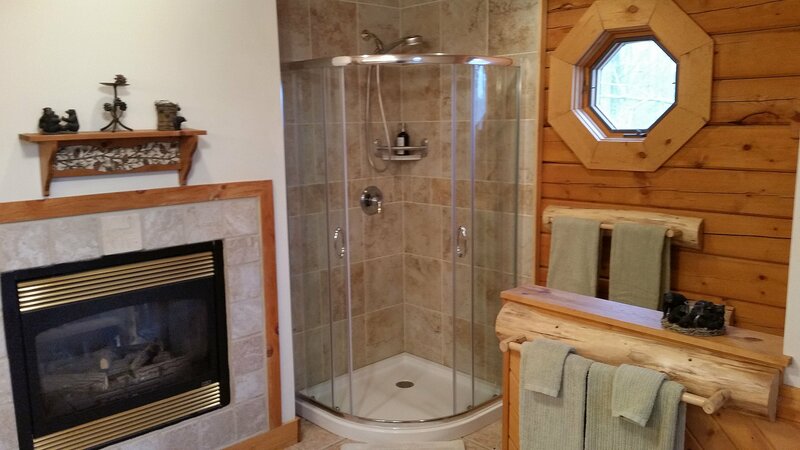 The master bath offers the luxury of a romantic, candlelight soak in your private "heart-shaped" 2 person Jacuzzi tub while watching the flames in the two-sided fireplace (gas fireplace use is seasonal). 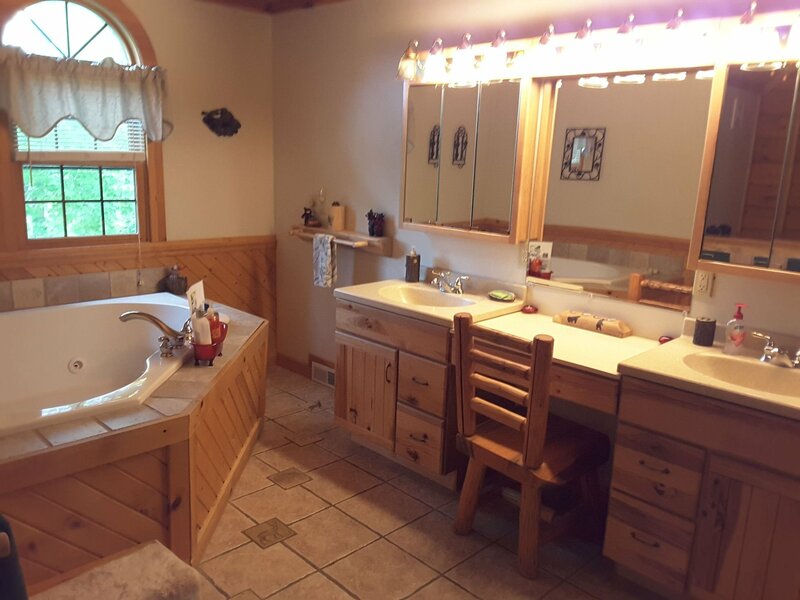 It also features double sinks, dressing table and separate shower. The master suite is a "Honeymooner's Paradise" in rustic elegance! New in 2018, the shower in the master bath features a tile surround, curved sliding doors, and a multi-spray configuration shower head on a hose. 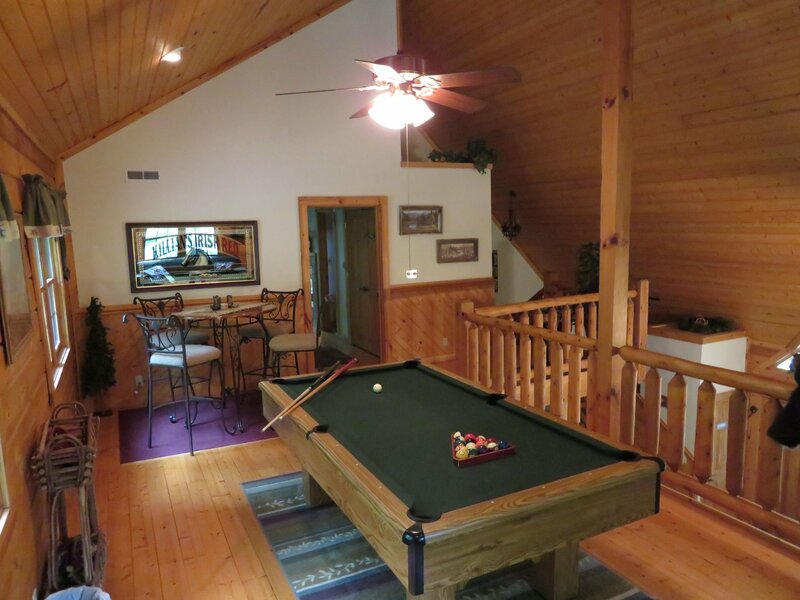 Just inside the front door, a log stairway takes you up to a gorgeous open loft with a pool table and a sleeper sofa. High ceilings, ceiling fan, dimmable lighting, and a high top pub table and chairs set the mood for fun and entertainment in a rustic “pub” atmosphere. This view from the other end of the loft looks towards the master suite entrance and the top of the stairs. 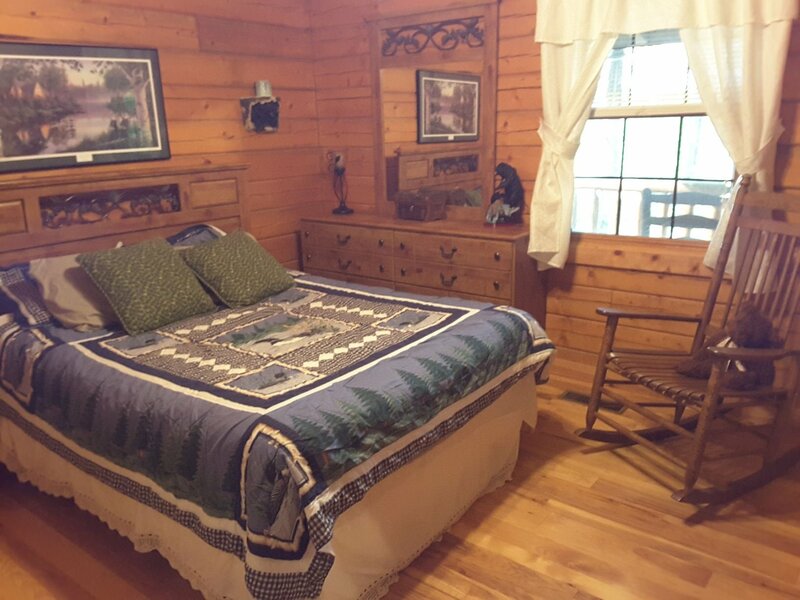 On the main floor, the front bedroom features a queen bed, dresser, night stand, ceiling fan, dimmable lighting, and a closet. The downstairs bathroom is just across the hall. Also on the main floor, the back bedroom features a queen bed, dresser, night stand, ceiling fan, dimmable lighting, and a closet. It has a door that opens to the downstairs full bathroom, and another door that opens onto the back porch. 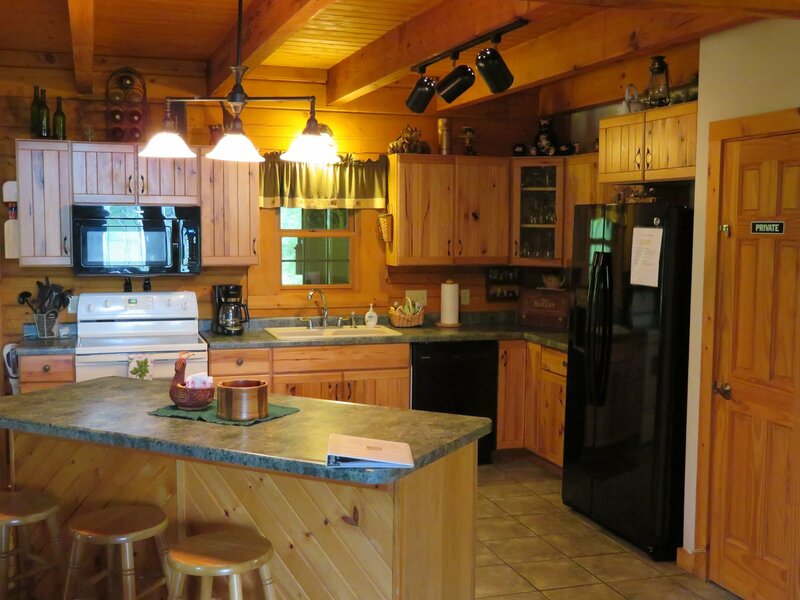 The kitchen is fully equipped for everything from coffee and toast to creating a full Thanksgiving dinner. A center island allows plenty of room to entertain with your family or friends. 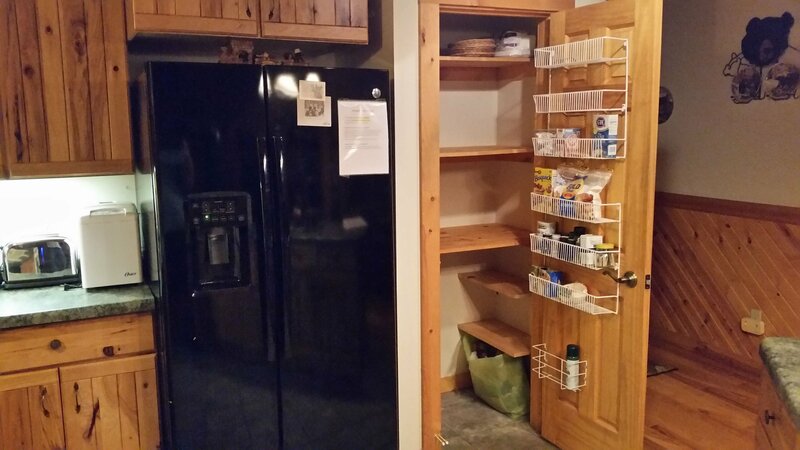 A pantry is provide for guests to store supplies for longer stays. Some standard staples are stocked in the pantry, along with plasticware, paper plates, and napkins. The dining room table seats eight. Use the dimmable lighting or provided candles to set a romantic mood. The french doors open onto the sun deck. 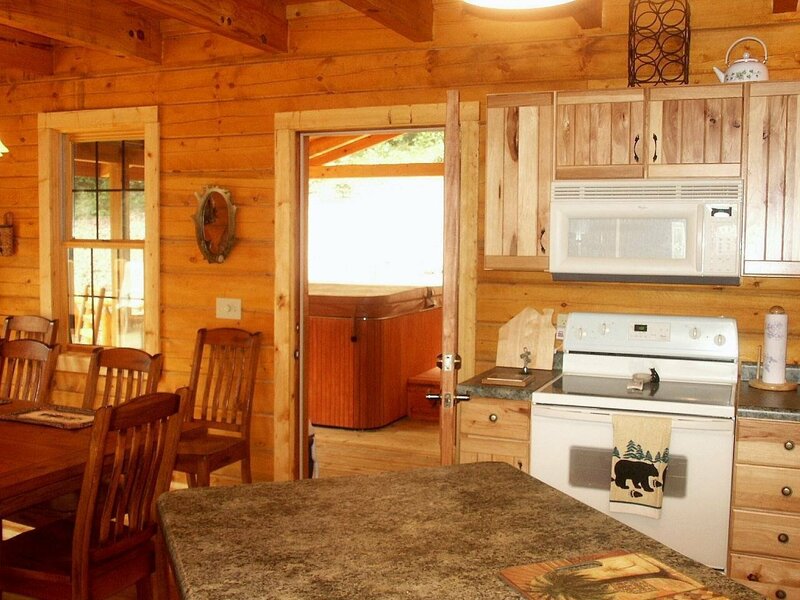 The dining room/kitchen area opens onto the hot tub deck at the back of the cabin. 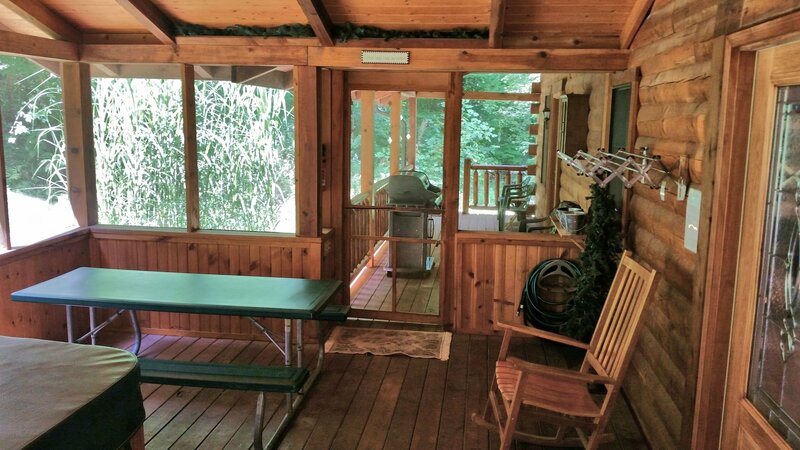 The private, screened back porch is surrounded by woods. It features a 6-person hot tub with a cover lifter that makes it quick and easy to get the hot tub ready to enjoy. 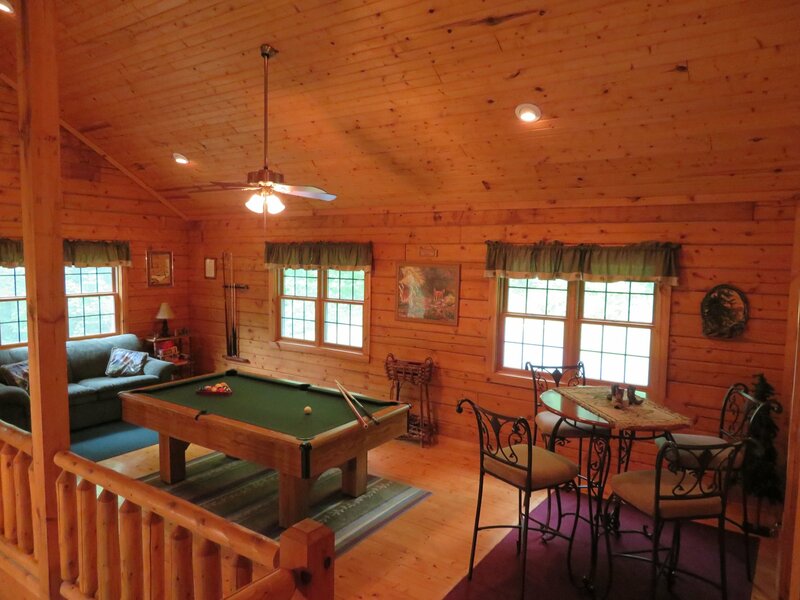 There is also a picnic table, rocking chair, and ceiling fan for your outdoor comfort. 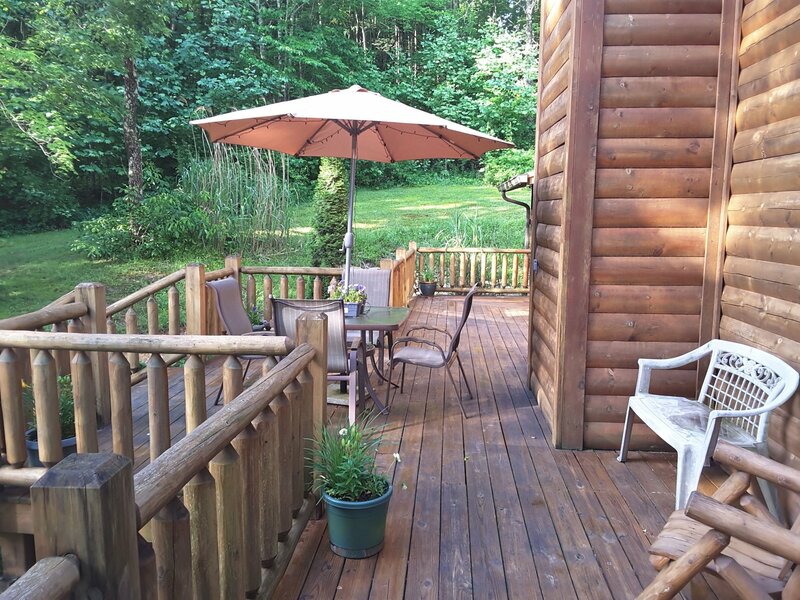 Outdoor furniture is provided throughout the porches and decks that surround Adventurewood. This is the view from the hot tub porch to the back porch. An expandable rack is provided for drying towels that have been used by hot tub fans. Grill tools are provided in a cabinet mounted on the wall across from the gas grill. 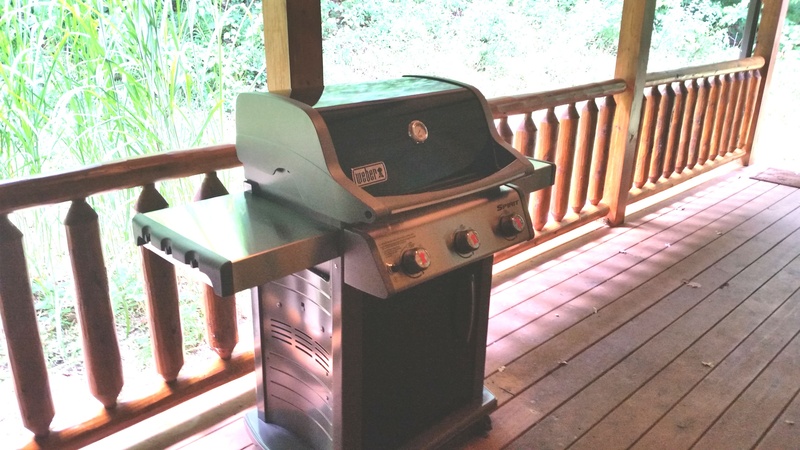 This Weber gas grill is first-rate for all of your outdoor cooking needs. 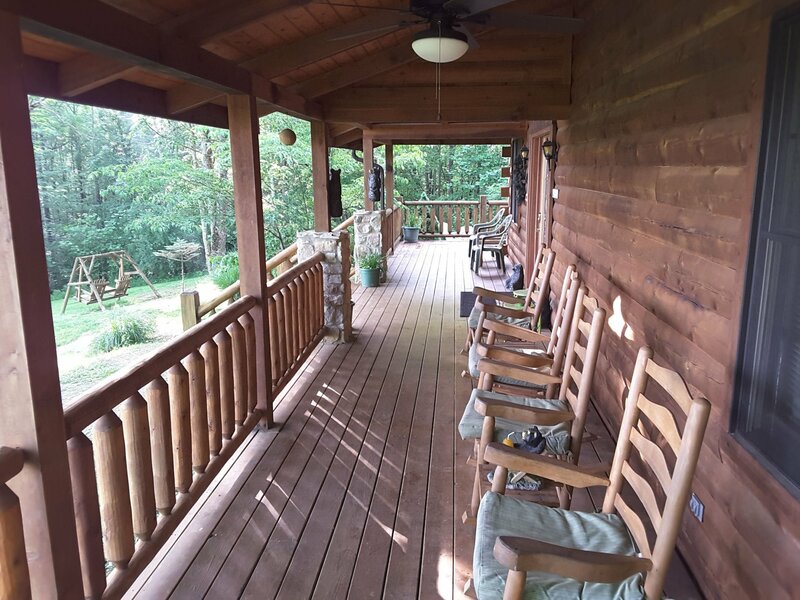 Set back from a quiet country road on a secluded wooded knoll, the view from the front porch of Adventurewood Log Cabin overlooks one of the prettiest valleys in Brown County. Your closest neighbors are the deer, turkeys, and geese you will see from your rocking chairs on the front porch at dusk. The Sun Deck is a great place to enjoy an outdoor meal or drink while surrounded by nature. 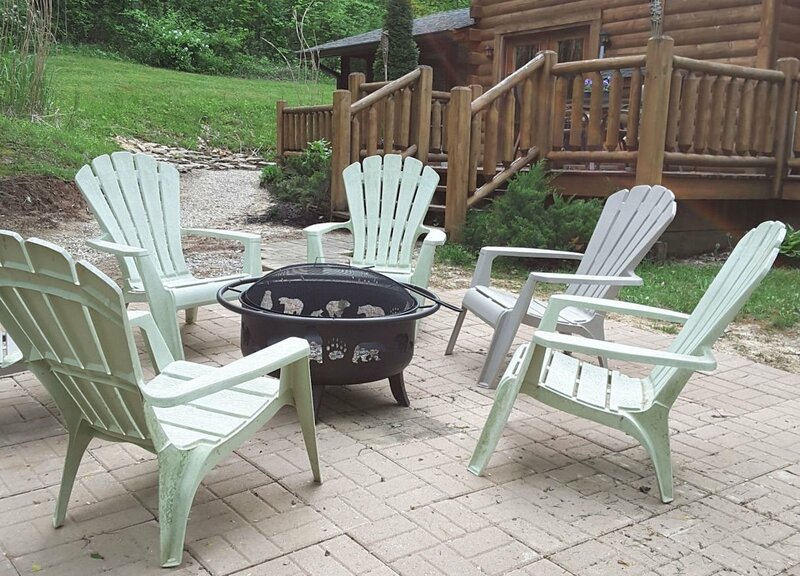 Just off the sun deck is the outdoor fire pit for enjoying an evening relaxing by a fire, or quiet moments and a cold drink on the log swing just down the hill. 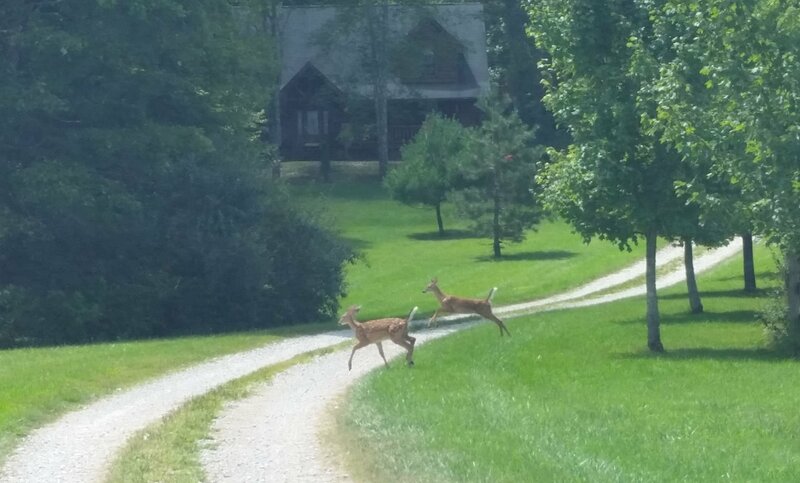 In spring and early summer, it is not unusual to see fawns romping in the lawn at Adventurewood. 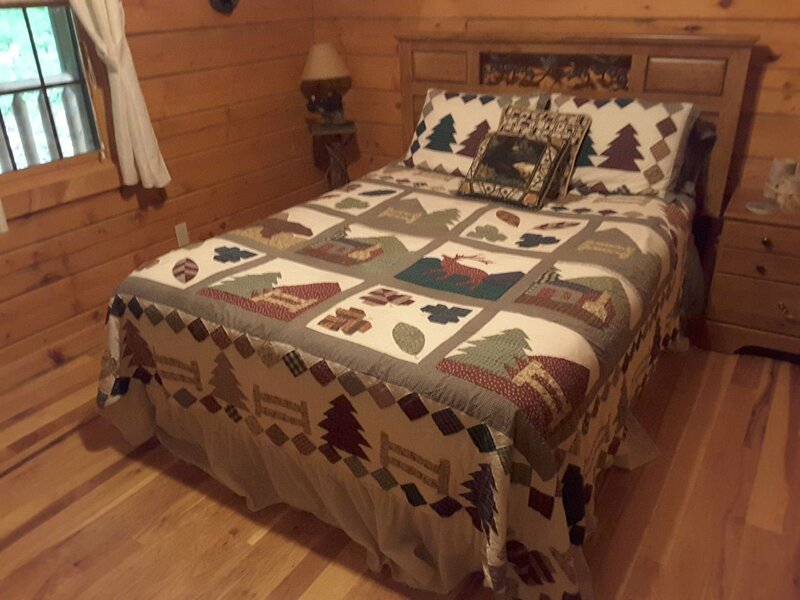 Every effort has been made in building, furnishing, and decorating Adventurewood Log Cabin to provide our guests a wonderful, private and relaxing family vacation, group getaway, special honeymoon, or anniversary in your “Brown County Home-Away-From-Home”. 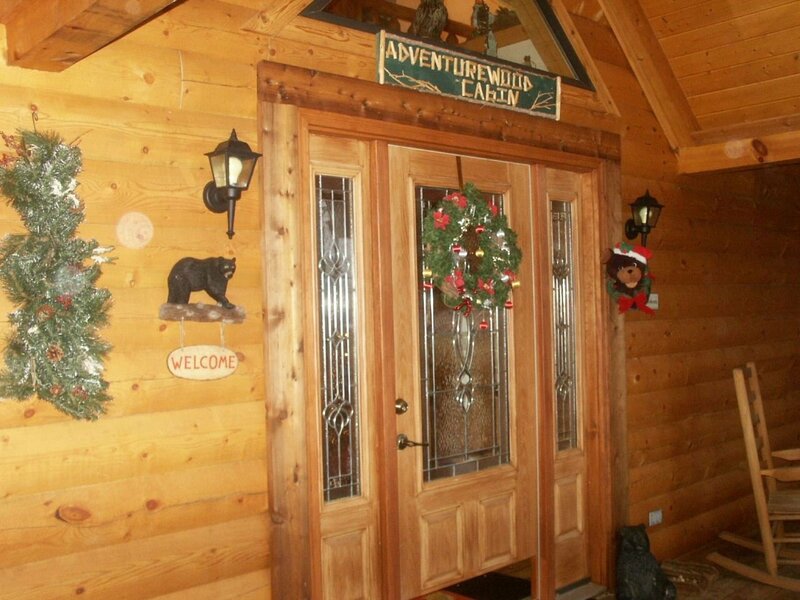 Adventurewood Log Cabin, a vacation home for all seasons.